Although not in the way he conceived, Netanyahu was right. In the flurry of activity this week marking the fiftieth year of the occupation, many have forgotten that the basis of its regime existed well before 1967. The Emergency Regulations, a product of Britain’s colonial mandate, were first exercised on the 150,000 Palestinians who remained inside Israel’s borders after the 1948 war. The state honed its discriminatory policies of land grabs, checkpoints, and brutal violence against its minority citizens for two decades, before transferring them to the Palestinian territories. The shadow of military rule has never left Palestinian life in Israel. Dozens of civil laws, most of which were written in neutral terminology or bestowed extensive powers to the state, continue to ensure Jewish privilege at the expense of Palestinian citizens’ rights. Over twenty of these laws were enacted by Netanyahu’s governments in the last eight years, with some of the most egregious ones being condoned by the Supreme Court itself. The result was a nuanced system that maintained the appearance of a democracy, but in fact cemented racial hierarchy among Israel’s citizens. Had they made that decision a year ago, Kerry and Obama might have left a meaningful legacy on the conflict; but this is not the case. Palestinians and Israelis have watched previous American presidents launch dramatic peace moves in the twilight of their administrations: Clinton with Camp David in 2000, and Bush with Annapolis in 2007. The late timing of these initiatives proved to be ineffective and even detrimental: they heightened the tensions and the stakes for the parties to agree on a rushed solution, and cast heavy doubt that any major decisions would survive under the next presidency (or under a new Israeli premiership). This is why, contrary to what my colleague Dahlia Scheindlin argues, the Left has every reason to remain critical of the U.S.’s abstention. It is a failure of policy to be eight years late to a diplomatic move that could have had a significant impact on the conflict’s developments. It is a failure of principle to wait 36 years before allowing the Security Council to re-echo the U.S.’s own position that settlements violate international law. And it is a failure of political will to do all this just a month before the curtain closes on Obama’s presidency. Israeli security authorities view hunger striking Palestinian prisoners as political time-bombs that can undermine the occupation’s control. The High Court agrees. In a unanimous decision by a three-justice panel, the Israeli High Court on Sunday approved the legality of the force-feeding law, which was enacted by the Knesset in July 2015. The law allows Israeli authorities to forcibly feed hunger striking prisoners against their will if their health condition is deemed to be life-threatening, and if the measure is approved by the attorney general and a District Court judge. The procedure involves transmitting food into the patient’s body, either through the vein, through an open cut to the stomach, or more commonly through a rubber or plastic tube inserted up the patient’s nose or down the throat. Aside from its physical and medical dangers, the practice of force-feeding poses legitimate legal and ethical dilemmas. On the one hand there is the need to respect the hunger striker’s right to protest, their personal dignity, and control over their body. On the other hand there is a need to protect the striker’s most fundamental right of all: his or her life. The court’s ruling went against the combined positions of human rights groups, UN experts, and both the Israel and World Medical Associations, all of which regard force-feeding as a serious breach of medical ethics, a violation of national and international laws, and a practice that amounts to torture and ill-treatment. Physicians for Human Rights-Israel, one of the petitioners in the case, stated that the court’s ruling dismissed their arguments and “relied on a minority position of Israeli ethicists and physicians that support [the law].” The Israel Medical Association also declared that it would continue to instruct doctors to disobey the law and any orders to implement it. In an interview with +972, the Hague representative of Al-Haq, a Palestinian human rights group, talks about the slew of threats she and her organization have received for months, and why she believes the Israeli government is behind them. The four organizations anticipated a backlash from Israel, which made no secret of its hostility towards the Palestinians’ attempt to pursue an international legal track to seek accountability. What they didn’t anticipate was how severe that backlash would be. Since September 2015, several of the organizations have faced ruthless smear and intimidation campaigns seeking to discredit them and stoke insecurity among their staff. The harassment culminated in death threats made against two individuals: A senior Palestinian advocate in Al Mezan, whose identity has been kept confidential but who will be discussed in Part II of this series; and Nada Kiswanson, 31, a Palestinian-Swedish lawyer who is Al-Haq’s representative in The Hague. Although the death threats began in February 2016, Kiswanson initially kept a low profile, concerned first and foremost for the safety of her family including her husband and two-year-old daughter, and in the hope that the Dutch authorities would find the culprits immediately. But the authorities still haven’t tracked them down, and the attacks only escalated. Kiswanson finally went public about her case last week. Black American activists have delivered a powerful message to Palestinians and other oppressed communities around the world: you are not alone in your causes. Of all the discussions I ever had about the Israeli-Palestinian conflict, undoubtedly the most engaging ones were with delegations of black Americans who visited the region to learn firsthand about Palestinians in the occupied territories, inside Israel, and in refugee camps. These groups – made up of community organizers, students, journalists, judges, and others – not only found commonalities with the experiences of Palestinians, but shared their own lessons of struggle against racism, state violence, and inequality. The “Invest-Divest” chapter of the platform of the Movement for Black Lives (M4BL) is an outcome of that growing exchange between black Americans and Palestinians. The chapter, which partly addresses foreign policy concerns in various countries, outlines clear and practical ways for Americans to help in ending the Israeli occupation. These include engaging the Leahy Law to withdraw military aid for human rights violations; campaigning against private security companies like G4S; and fighting state legislation aimed at silencing BDS activism in the U.S. The platform’s alliance with the Palestinian struggle – including its support for BDS, which was founded by a Palestinian civil society coalition much like the M4BL – has raised the public profile of the Palestinian cause at a very critical time. The political leaderships in Palestine, Israel, and the U.S. have shown little will or legitimacy to make progress in the conflict, leaving grassroots and civil society movements as the only agents actively challenging the worsening status quo. Thus by including their cause among their international priorities, black activists have delivered a powerful message to the Palestinian people: you are not alone in your struggle. Israel’s revocation of permits and closure of Yatta this week reflect its need to keep the Palestinian issue at bay by controlling and threatening their people for every action of a few. A Palestinian family from Nablus was supposed to visit their relatives in an Arab town in Israel for Ramadan later this month. They were especially excited that they would get to see the beach in Jaffa for the first time, which despite being only an hour’s drive away was normally inaccessible to them as residents of the West Bank. But on Thursday morning they were informed that they couldn’t go anymore: their permits to enter Israel had been revoked because of a shooting in Tel Aviv by two Palestinian gunmen on Wednesday evening. The family had nothing to do with the attack in Tel Aviv. But the Israeli government seemed to think otherwise when, just a few hours after the incident, it suspended the permits of 83,000 Palestinians from the West Bank and Gaza who had hoped to see distant family members, vacation in cities in Israel, and pray in Jerusalem during Ramadan. On the same day, the Israeli army sealed off the shooters’ hometown of Yatta near Hebron, trapping its 64,000 residents while soldiers raided homes in search of the attackers’ accomplices. For many Israelis, these heavy responses are logical security measures: they can increase the chances of achieving operational goals, and deter others from committing similar attacks by demonstrating the severe consequences for such actions. This approach, however, is abhorrently illegal and immoral – and simply doesn’t work. Collective punishment has been Israel’s main response to Palestinian altercations of any kind for decades, from demolishing the homes of Palestinian attackers’ families to imposing a blockade on 1.7 million people in the Gaza Strip. Yet all these policies have failed to dissuade Palestinians from resenting the occupation or from resisting it violently or nonviolently. If anything, they only refuel Palestinians’ antagonism, feed the cycle of violence, and make future attacks all the more likely. For young Palestinians, Nakba Day is dedicated to remembering the catastrophes that our grandparents went through. But with every passing year, we realize how much the day belongs to our catastrophes too. My maternal grandfather was born in 1929. Although Alzheimer’s disease eroded his memory during the later years of his life, he had a surprising knack for recalling his experiences growing up in Haifa under the British mandate of Palestine. He described the open plains he crossed with friends to swim at the beach; the diplomats and missionaries who traveled through Haifa’s German Colony; and the port and railway that linked Palestine to other Arab cities and the Mediterranean region. Although he couldn’t remember that he had repeated these stories countless times before, I never grew tired of hearing them; they breathed life into a world I could only read about in books and gaze at through black-and-white photographs. Like all Palestinians of his generation, my grandfather lost that world in 1948. At the time he was living in Tira and studying at a British school in Tulkarem, but when the war broke out he joined a local resistance group to fend off Zionist forces from the village. The armistice agreement made Tulkarem part of the Jordanian-ruled West Bank, while my grandfather was made an Israeli citizen in Tira. For 18 years he lived under Israeli military rule, watching the village’s lands being confiscated and used to build new Jewish settlements. When he wanted to leave the village, he had to get a permit. When he wanted to walk to a neighboring field, he had to be searched at a checkpoint. Military rule ended in 1966, and my grandfather – by then a historian and a teacher – was able to explore the land again. But the country he remembered had changed. Hundreds of villages and their inhabitants had disappeared. The main road going up Haifa’s Carmel mountain was no longer known by the Arabic “Shere’ al-Jabal” but by its new Hebrew name “Derech Hatziyonut.” When Israel captured the West Bank and Gaza the following year, the soldiers who once guarded the entrance of Tira were now stationed near his old school in Tulkarem. The occupation was both a gift and a curse: it allowed my grandfather to reconnect with his Palestinian brethren, but at the cost of their subjugation under the same regime he had endured. An anti-torture law currently being drafted by the Justice Ministry is not enough to fix an entire legal system that allows the practice to be used against an occupied population. During its review session at the UN Committee Against Torture in Geneva on Wednesday, Israel’s representatives informed the committee that the Justice Ministry is drafting a bill that, for the first time, would explicitly enshrine torture as a crime under Israeli law. This appears to be a very positive development in a years-long battle to end Israel’s use of torture, championed by torture victims, human rights groups, and UN bodies. Along with the court’s ruling, Israel has an array of legal and administrative tools that enable the use of torture. For example, a temporary order which has been repeatedly renewed since 2002 exempts the Shin Bet from making any kind of recordings during interrogations of “security” suspects; in other words, the security service has a carte blanche to torture detainees with no evidence to hold them to account. Knesset members have introduced further legislation, like the Anti-Terrorism Bill, which would enshrine various emergency regulations into official law and, by broadening the definition of what constitutes a “terrorist,” would grant the state more draconian powers. 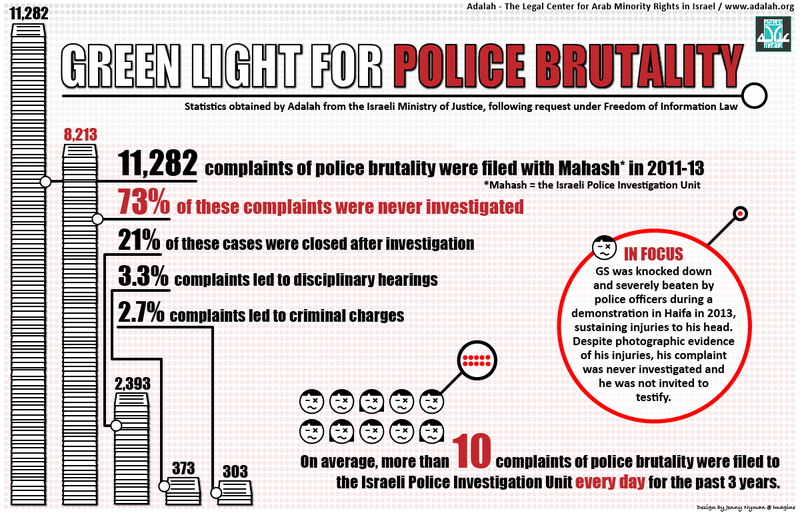 All the while, not a single criminal investigation has been opened into the use of torture by Israeli officers and interrogators, despite over 850 complaints filed since 2001.